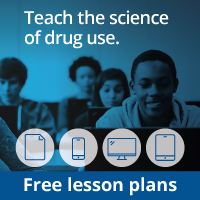 Can the students clearly express their thinking about drugs? Can the students modify their work to reflect their new thinking? Do the students understand what addiction is? Are the students approaching the task logically and methodically? Are the students able to summarize their thinking and express their conclusions about the program? Do the students understand how drugs can change the brain? Below are some additional activities that can be done after completion of the sixth mission. These activities are extensions to many areas of the curriculum. Have the students develop an awareness campaign about drugs in their school. As part of the campaign, they should develop posters, brochures, and flyers. They can include PET scans, diagrams of the brain, and illustrations of neurotransmission to develop compelling, persuasive pieces. Challenge the students to develop a model of the brain. They can use clay or other materials to build an anatomically correct, detailed model. Have the students make a list of aspects of their lives that involve competition and those that involve collaboration. For example, in baseball, you compete against another team, but you need to collaborate with your teammates to win each game. Do the students think that there is a place for both in their lives? When is one more appropriate than the other?